It's a thing almost no one wants to talk about, but almost all of us will experience at some point: A stale, kind of gross smelling bedroom. You know the smell — what is it? It's not quite B.O. ... it's something more stale and stagnant. You may not think it's happening to you, but … it probably is, especially if you share your bedroom with another person. The stench is caused by a number of factors; from poor air circulation to the fact that we sweat and leave dead skin and body oils all over our sheets that over time, begin to smell, well, stale. While you may be tempted to reach for room sprays, those will really only mask the odors. But good news: Bedroom odors are pretty easy to keep at bay, and these tips will help you do just that. 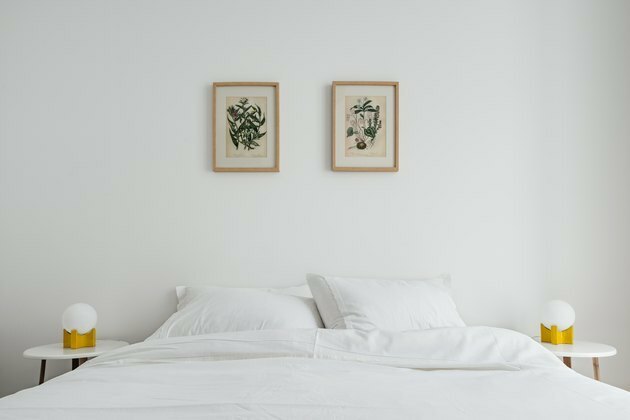 This may sound a little, "LOL, DUH" to most of you, but it's well worth saying: The best thing you can do to keep that stale, human-y odor from totally overtaking your bedroom is to regularly launder your sheets. How regularly, you ask? Well, once a week or once every other week is ideal. Once a month is iffy, but okay. But letting your sheets remain unlaundered for longer than that is no good — not only will the sheets smell, they'll be quite dirty after a month of sweating and drooling and ahem doing other things on them. Detergent choice — that is, the use of scented versus unscented detergents — doesn't have much bearing on the cleanliness of your sheets and should be entirely based on personal preference. However, if you do notice that odor in laundry is an issue for you, try switching to a sports detergent like Sport Suds, as those are formulated to be extra tough on smells. I'm a big believer in making the bed every day, but that's not what we're here to talk about today. (JUST NEEDED TO GO ON THE RECORD WITH THAT ONE!) I mention that, however, to offer this tip for other regular bed-makers —if you can, leave a little bit of time in between getting out of bed and making it (maybe while you shower/get dressed/make breakfast/etc. ), and toss the covers back during that little bit of time to let some air circulate. Speaking of air circulation, getting fresh air in the space by opening a window is the easiest way to ensure that a bedroom doesn't start to smell stale. If opening the window isn't realistic because of weather, structural or safety concerns, having a fan like this super quiet and fairly stylish Dyson number to move air around will help. A big culprit in the "what in the world is causing my room to smell so … stale human-y??" is the larger items on our beds that aren't frequently (or ever — yikes) washed. Things like the duvet insert or comforter, mattress toppers like feather beds, pillows, and even the mattress itself retain odors that can take over a room. Duvets, comforters, and pillows should be washed one to two times a year; most can safely go in the washing machine, though depending on your laundry set-up, it may be best to hit up a laundromat to make use of the oversize washers. Check the care tag, especially with pillows, to determine if machine washing is an option — if not, sending those items out for dry cleaning will be the best bet. When it comes to machine washing things like pillows and duvets, it can be helpful to include an odor-eliminating laundry booster like Zero Odor or a sports detergent, which is formulated to have extra smell-blasting power, like Sport Suds. In the dryer, use a set of dryer balls, which will help to speed up drying time and fluff stuffing back up after it's been through the wash.
Mattresses, too, will start to get a little funky-smelling over time. The best way to keep odors at bay is to vacuum (yes, vacuum!) the mattress semi-regularly — about 1-4 times a year, possibly more if you have pets who like to lounge on your bed. Use the upholstery and crevice tool attachments that come standard with most vacuums for the job. If a truly noticeable smell has permeated the mattress, sprinkle a liberal amount of baking soda on the surface, allow it to sit undisturbed for an hour or so, and then vacuum it up. Most of the stains that occur on mattresses (sweat, blood, sexual fluids, etc.) fall into the protein stain category and can be treated using an enzymatic stain remover like Zout or Krud Kutter Sports Stain Remover. Apply the stain remover to a light-colored cloth and use it to scrub at the stain, repeating as needed until the stain is gone. Let the mattress dry completely after spot treating before you make the bed back up. For very large or set-in stains, an upholstery cleaning machine may be required; this Bissell handheld model is a great and versatile option that will run you well under $100. Jolie Kerr is a cleaning expert, advice columnist and host of the podcast "Ask a Clean Person"
Do Vinyl Mattress Covers Make You Sweat?